Gamer Online | Tech news, Apps, Offers,Trick and Many more…!!! Tech news, Apps, Offers,Trick and Many more…!!! How To Fix Windows 10 Update Installation Error. You might have come across the frequent error, while installing the downloaded updates for windows 10. most commonly seen error is while upgrading to windows 10 anniversary edition (version 1607). Disable the antivirus and windows defender service. Click on settings—> click on update and security—> Click advance options. Untick “give me updates for other microsoft products when I update windows”. Reboot and try to Install update. Hibernate being the most useful feature for Windows OS it lets you to save your work and resume it quickly. Most of Windows users use hibernation feature to quickly boot into Windows and resume their work. Though, by default, it’s not enabled in Windows 7, one can enable it by following our how to enable or disable hibernate feature in Windows 7/8/8.1/10 guide. However, hibernation feature is turned on by default on most Windows 10 PCs and but it doesn’t show up in power menu or power button by default. On Windows 10, it can be added to the Start menu power button by referring to our how to enable hibernate in Windows 7/8/8.1/10 guide. When you enable hibernate feature, Windows creates a new file named hiberfil.sys in the root of your system drive (drive where Windows is installed) to save the system state. Now, if you have a hiberfil.sys with a huge size, you might want to reduce its size to free-up some disk space. The default size of hiberfil.sys varies depending on the amount of RAM installed on your PC. For instance, it’s taking 2.97 GB of disk space on my PC with 4 GB of RAM. One can reduce the hiberfil.sys file size by executing a simple command in the elevated Command Prompt. But we recommend you keep at least 70% of the original size of the hiberfil.sys. Step 1: Open elevated Command Prompt by typing CMD in Start menu search filed, right-click on Command Prompt entry and then click Run as administrator. Step 2: In the command prompt, type the following command and hit enter. In the above command, replace percentsize with your value (for example, 60%), but it cannot be smaller than 50. Step 3: Exit the Command Prompt and you are done! Ever wonder why you can’t see some Files and Folder in Windows os though you can access them using Path. Windows has a feature called the system folder and assigning the system flag on folder is by default invisible to user unless user don’t change the settings . right-click on the command prompt icon in the Start menu or Start screen. You are free to set password for this Account. The administrator account will now be disabled. Multiple ways to open command Prompt. Press “Win + X”, and click/tap on Command Prompt, or Command Prompt (Admin) to open it in Administrator mode. Open Task Manager with more details. Choose File and then Run New Task. Type cmd or cmd.exe, and hit OK to open up a regular command prompt. You can also check the box to open as administrator. To open a command prompt in Administrator mode from the Task Manager, you can hold the CTRL key while clicking File -> Run New Task and it’ll immediately open an administrator mode command prompt. You can easily open the command prompt by typing “cmd” into the search box (Win + S). Alternatively, click/tap on the microphone icon in Cortana’s search field and say “Launch Command Prompt”. To open as Administrator, type cmd into the search box, and either right-click and choose Run as Administrator, or highlight the result with the arrow keys and press CTRL + SHIFT + ENTER to open an administrator mode command prompt. Open the Start menu, and click/tap on All apps at the bottom. In All apps, scroll down and expand the Windows System folder, then click/tap on Command Prompt. Open File Explorer, and navigate to the C:\Windows\System32 folder, and click/tap on cmd.exe. You can actually do this from any file browser window by right-clicking on cmd.exe and choosing Open. Press the “Win + R” key to open RUN dialog box. Type cmd, and click/tap on OK.
Open File Explorer, and click/tap on its address bar (or press “Alt + D” on your keyboard). Now simply type cmd in the address bar and it’ll open the command prompt with the path to your current folder already set. 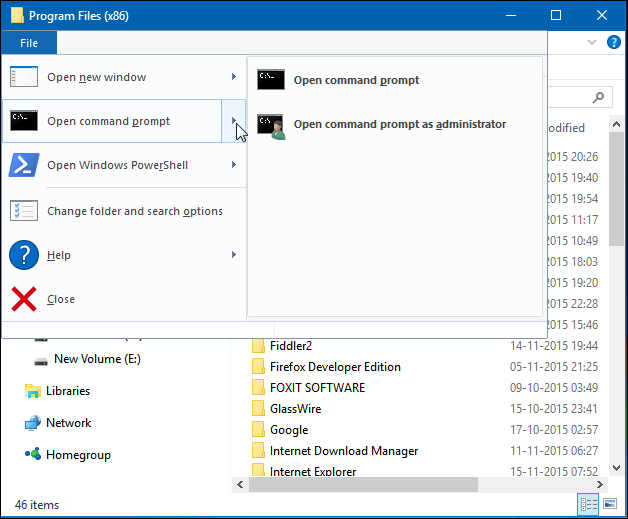 Open command prompt — Opens a Command Prompt within the currently selected folder with standard permissions. Open command prompt as administrator — Opens a Command Prompt within the currently selected folder with administrator permissions. To open a Command Prompt window in any folder or drive, hold down the shift key and right-click on the folder or drive. 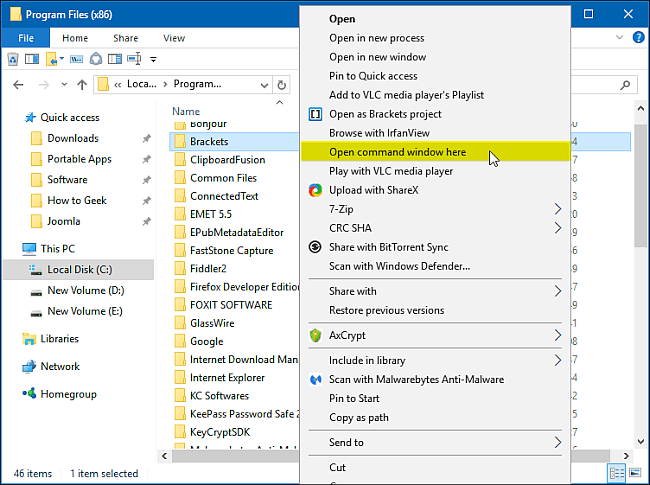 Right-click on a folder or empty space in the right-hand pane of Explorer while holding down the SHIFT key, and from the context menu, select “Open command window here”. The prompt takes the path of the folder from where it is opened. Note that normally you have to press the shift key to get that option. To make this option permanent, follow this simple registry hack. Right-click an empty spot on the Desktop. 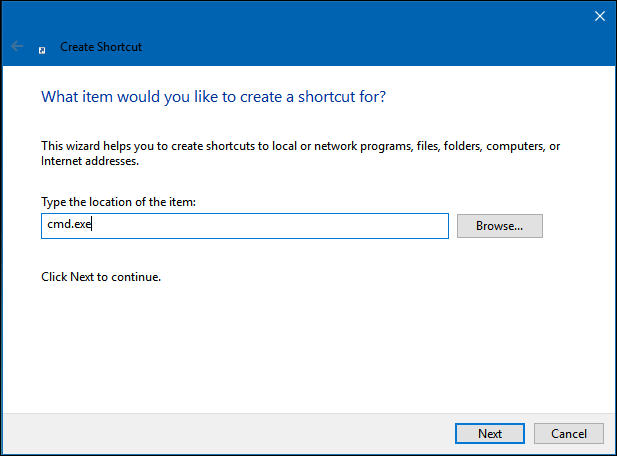 From the context menu, select “New > Shortcut”. In the box labeled “Type the location of the item,” enter “cmd.exe”. Press “Next”, give the shortcut a name and choose “Finish”. If you want to open the command prompt in Administrator mode, right-click on the new shortcut icon and choose “Properties” from the context menu. Click the “Advanced” button and check “Run as administrator”. 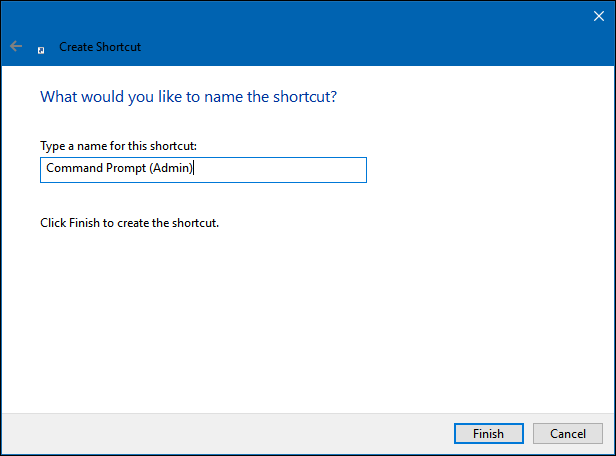 Now you have created a shortcut that will open the command prompt with administrative privileges when double-clicked. 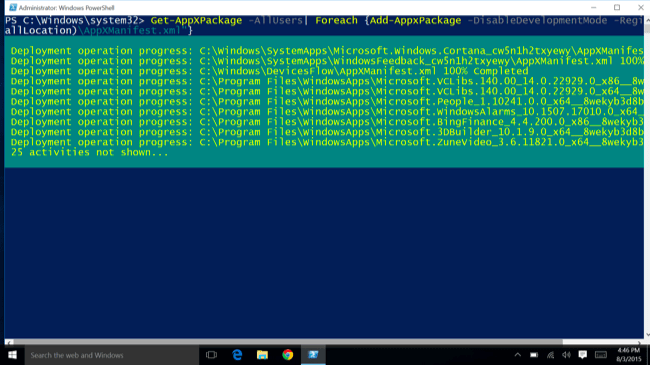 If you want the preinstalled apps back, you can get them back with this method using PowerShell code. type PowerShell in search right-click on PowerShell run as Administrator. It will certainly take some time. If you see error then do the procedure again. on successful finish you can see apps in start menu. Want to get rid pf the unwanted bloatware (Pre installed application). Some apps allow you to uninstall them in the normal way. Using PowerShell just paste these commands and press Enter.